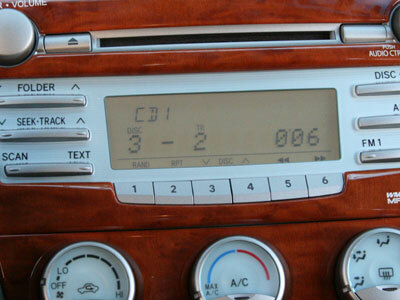 Below are the general guidelines for connecting GROM-IPOD or GROM-USB interface to the Toyota car stereo. This particular car is Toyota Camry 2009. 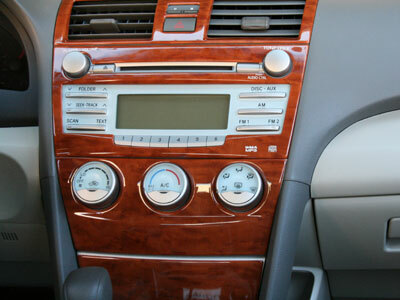 Our posted car stereo removal instructions help with aftermarket adaptor install projects, iPod, XM, USB, Sirius, MP3, Bluetooth, video or audio when you need to reach to the back of the Toyota stereo for the installation. 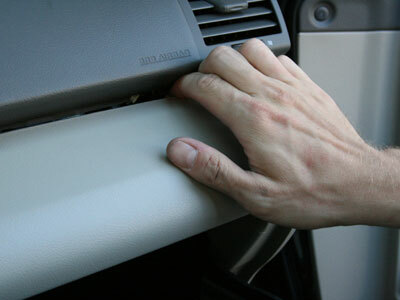 Locate the glove box, open it. 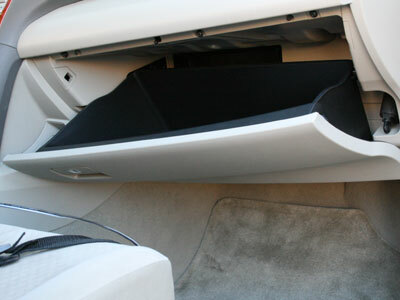 You will see the screws that connect glove box cover to its compartment. 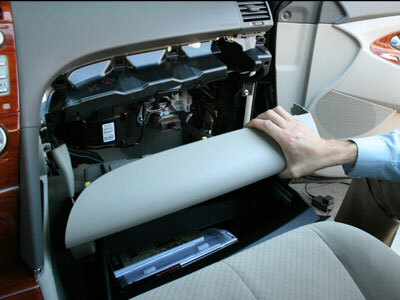 Take the Phillips screwdriver, unscrew 4 screws (3 on top and 1 at the left side underneath the glovebox). 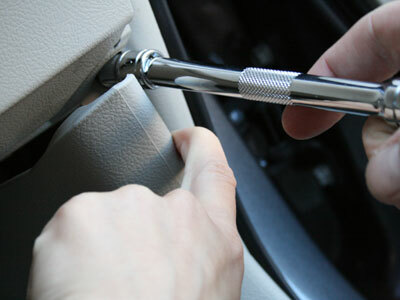 Place screws in the secure place and be careful not to loose them. Take the TOY cable. 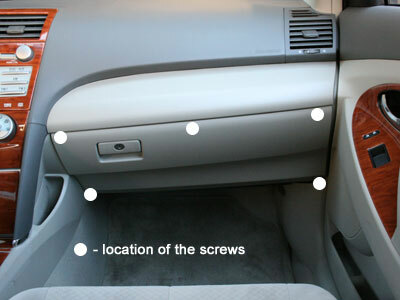 Locate the end that goes to the car stereo as shown. Make sure the flat side is up ! Lead the TOY cable through the hole in the dashboard. Connect the TOY harness to the stereo. You will need to find the right socket by feeling, please refer to the picture below. The socket that you need is the second from the right at the back of the stereo. 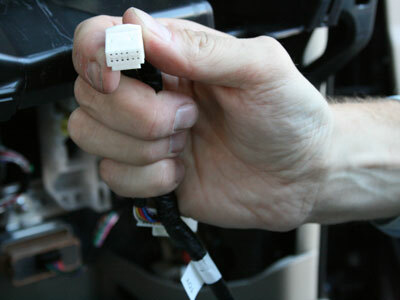 Connect the GROM-USB or iPod adapter to the other end of the TOY harness; test the functionality of the adapter before assembling back the glovebox. You can try it with USB stick provided in your package. Please don't forget to place your favorite tunes on the USB stick and create directories as explained in the Manual. You should see Disk 1 Track 1 on the stereo screen. If you don't see anything - please refer to the troubleshooting section of your manual. If everything is working as it should, disconnect the GROM box from the TOY harness. 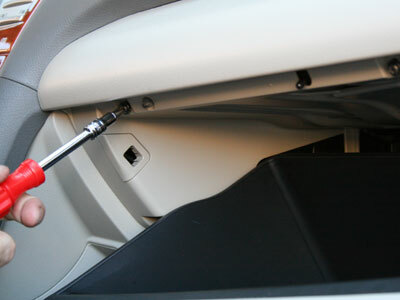 Carefully place the glovebox back until it snaps to its place, and lead the TOY harness through the hole inside to the glovebox. Put all the screws back to the original location. 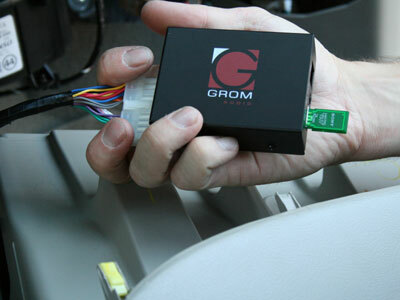 Connect GROM box to TOY harness and leave it inside of the glovebox. 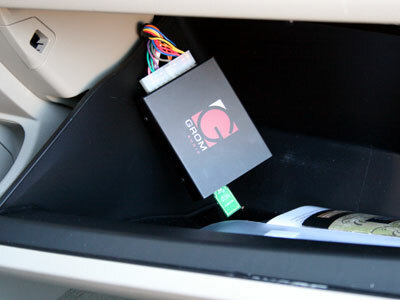 You can start using your GROM USB, iPod or AUX car adapter now! 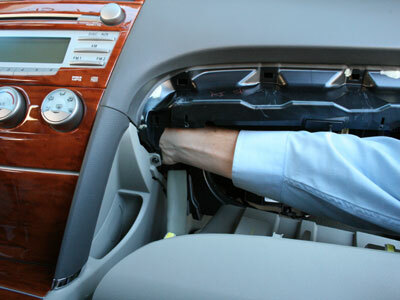 * Note: Please make sure that everything that you unplug from the car stereo is connected back! All material and content are property of gromaudio.com and (or) www.indashpc.org The material and content on this site are protected by international copyright laws. You may not modify, duplicate, reproduce, publish, upload, transmit, or distribute in any way (including by way of email, facsimile or other electronic means) material and content from this site, unless specified, without written permission from gromaudio.com. You may download certain content or materials on specified pages from this site for personal, non-commercial use only. All other logos, banners, and certain content not affiliated or owned by gromaudio.com is the sole property of the rightful owner.